After working hard to get your app up and running, you have managed to get it into the app market. A close look at the analytics reveals that even though the app is downloaded a fair number of times, it fails to engage users like you had expected, leading to a low user retention rate. What went wrong? With so many apps out there in the market, the competition for attention and time is at an all-time high. According to a study by Nielson, the amount of time that mobile users spend on using apps is reaching new heights: a staggering 30 hours a month for each app per person on average. Not only that, the average numbers of apps that mobile users use is now 26.8. So how can you ensure that your mobile app gets the attention you desire? How can you engage the users in the most effective way possible? 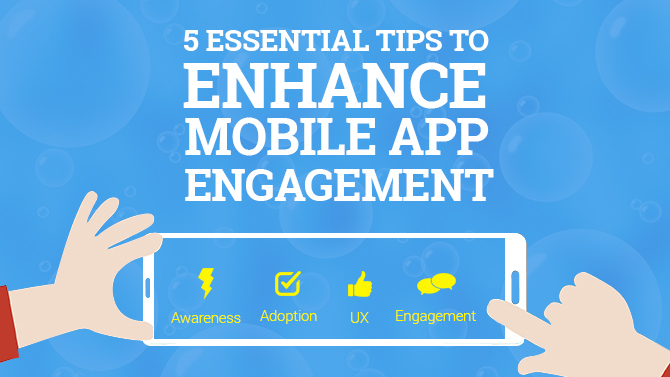 Read the tips below to learn of ways to enhance mobile app engagement. The first impression is the last impression. This saying holds true when it comes to creating a mobile app. You only get one chance to make a great impression the first time around. Even though the time spent using apps is more than half the total time spent with all types of digital media, mobile users are indecisive, and usually delete more than 70 percent of apps they install, and that too within a month. If you want to keep your customers engaged and engrossed, you need to have them coming back to your app again and again. To achieve this, your app should offer fresh content, interactivity, and features that will be authentically appreciated by your target audience. Your app’s navigation should be use. With that said, if your app has got anything less than a four-star rating on the app market, then you need to determine what went wrong – update the app to get rid of any issues, and offer a updated version to the public as soon as you can. According to research by Forrester, social networking apps take up 14 percent of all the time people spend using apps in a day – accounting to more than 25 minutes. It is important to implement social sharing into your mobile app as it allows you to leverage the power of social sharing through a mobile device. For instance, fitness apps almost always have a social sharing feature that enables users to share their progress with their friends. While it may not sound like a phenomenal feature, don’t forget the power of word of mouth marketing. A single share by a mobile app user can resonate with hundreds and thousands and even millions of other users. The effectiveness of this approach can be understood by looking at Volkswagen’s SmileDrive app. Users can create shareable travelogues that contains drive details, including miles, minutes on road, and weather together with photos as well as status updates. By offering a social sharing feature, the app offers a memorable brand experience while generating additional downloads and enhancing brand exposure. Everyone loves promotions. People love the opportunity to score and to win prizes. Due to the fact that mobile is a dominant media, statistics show that mobile ads are 5 times more effective than online ads. This means that you should develop mobile-specific promotions that are accessible only to mobile app users. This will instill in them a sense of exclusivity, encouraging participation. Gamification is yet another way that can drive engagement. You can ask your users to post pictures of them interacting with your brand, or get friends involved for a reward. All mobile app users complete a series of events or actions during each app session. These actions can be easily tracked using app analytics. The data you gather will provide you valuable insights regarding the screens that your users find most engaging as well as those screens that ‘convert’ the most. The user actions are a reflection of their interests. Information such as the time they spend on a particular page and the actions that they do on those pages can assist you in targeting the users even after they have concluded an action. This can be done through personalized & targeted in-app messages. Take the example of a shopping cart: this is where a user can add a product and then complete a checkout later on. As soon as a user adds a particular product into the cart, you can learn what types of products are of interest to them, and then you can target them with personalized offers. To prevent losing users after they download your app, you should plan mobile re-engagement campaigns as they provide an excellent way to get users to reengage with your brand. They carry a strong performance record, including high return in investment (ROI) and click-through rates. All major mobile app advertising platforms provide services for retargeting ads; these include Twitter, Facebook, Google, Yahoo, and various other small ad platforms. Make sure you dedicate some time and money to run re-engagement campaigns so you can remind your users about your app and increase user engagement. Depending on the complexity of a mobile app, the average cost of development a branded app ranges between $50,000 to more than $1 million. This makes it necessary for businesses to make sure their app is generated the biggest possible ROI. But in order to get the right returns, everything boils down to user engagement –regardless of what your budget is. The most expensive mobile app would not be worth it if it fails to keep users engaged. It doesn’t matter if you are currently planning a mobile app or have already launched one – make sure you have a strong engagement strategy in place to ensure maximum mobile app engagement rates.